Share Diners & Drive-Ins TV Unofficial Guide with your friends ! What is new in Diners & Drive-Ins TV Unofficial Guide? Welcome to the best-selling guide to the hit TV show Diners, Drive-Ins, and Dives. 980 Diners locations as of 8/5//2017. 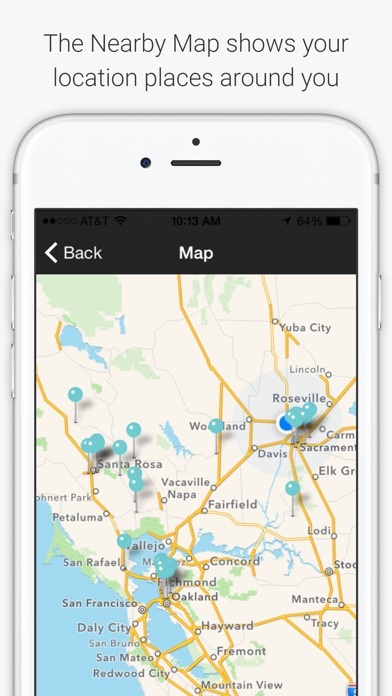 No other app has every location like we do. UPDATED weekly with each new episode and from user updates. NEW FEATURE - Track where you've been and where you still need to go. In-app Purchase for $0.99 yearly. 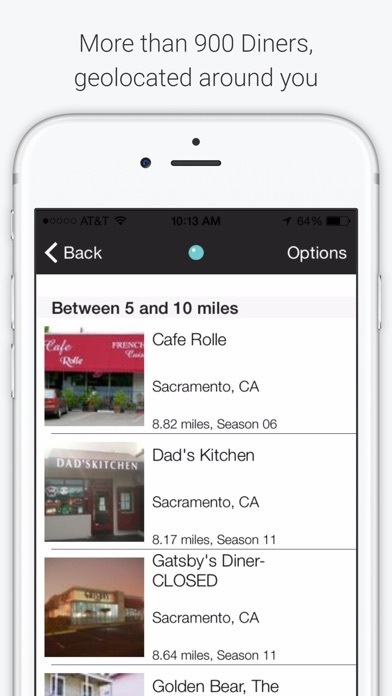 This app has all the locations visited by Guy Fieri on the show, geo-located around you wherever you are. Great for travelers looking for a good meal around the country. The Unofficial Guide to Diners, Drive-Ins and Dives has been one of the top 10 apps in the Food & Drink category almost every day for the last 6 months and was #1 for two weeks running. 80,000 users can't be wrong. We've collected all the locations for you, geo-located them, and organized them by season and state. Every venue from the show is in the app, including the closed locations or those that have changed hands and names. Some of the restaurants have closed over the years. We've left them in the directory, but added the word *Closed* to the name of each so you don't waste your time trying to go there. 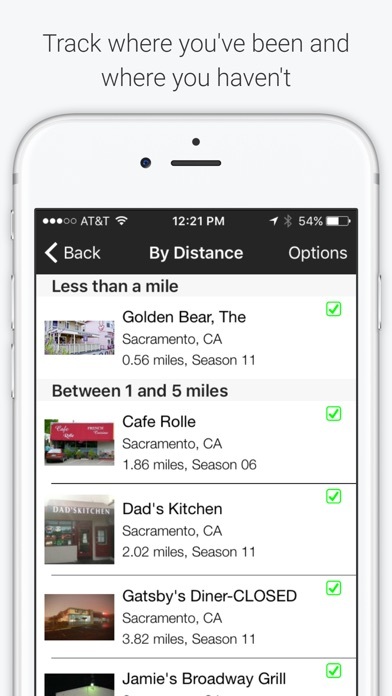 ► 980 Locations (as of 8/5/2017) and updated every week after the new episode airs, which is more than every other app – including the Food Network's own Food on the Road app (because we own them all and we check each week). Also, we regularly update closed or new addresses as we're informed by users. ► Recipes are sortable by season or by type of dish (main, side, breakfast, etc). ► Post your visits to your Facebook or Twitter account. ► Leave comments about why you love each location for others to see. Subscription - Track where you've been and where you haven't for $0.99/year reoccurring. - Checkin subscription is $0.99 annually, letting the user track which locations they've been to, and which ones they haven't. - Your subscription will automatically renew annually unless auto-renew is turned off at least 24-hours before the end of the current subscription period. 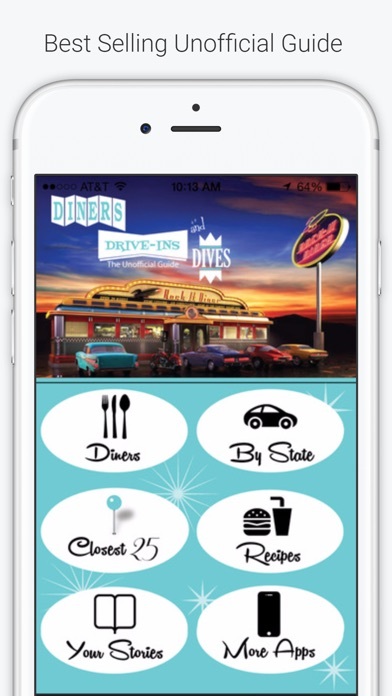 This app is not affiliated with the Food Network or Guy Fieri, but created using publicly available information about the locations highlighted in the Diners, Drive-ins and Dives TV show. 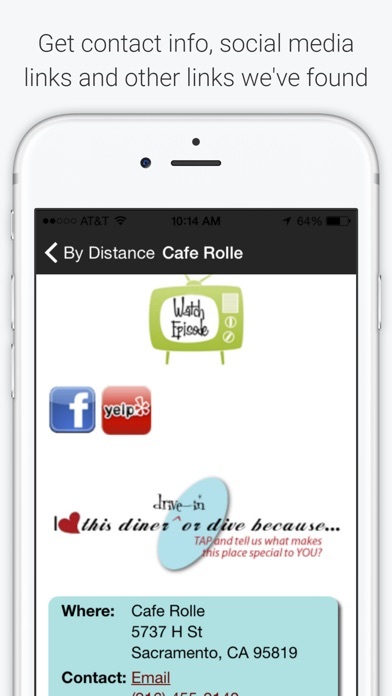 GoLocalApps designs travel and wine region apps and this one was a labor of love as we enjoy the show and wanted to find the diners as we traveled around the country. So we did this for ourselves and are sharing it with you. If you have any problems with the app, or have suggestions use the support link or email us at support@golocalapps.com. We'll be happy to help you troubleshoot any issues.